← Announcing New Webinar on Dating! The world of consecrated virgins is astir because a consecrated virgin has been alleged to be a “mistress” to an archbishop. It goes against the very heart of sacred virginity for a consecrated virgin to have an affair with any human being; the “fallen virgin” becomes an adulteress to her Divine Spouse. Excommunication and even (at one time) capital punishment were meted out to those who engaged in this serious and sacrilegious behavior in centuries gone by. This being said, now would be a good time to bring up the alarming case of the consecrated virgin, Indicia, because her story is a truly cautionary tale for consecrated virgins, bishops, and the faithful alike. Indicia was consecrated as a Spouse of Christ by Bishop Zeno. At the time, she was an orphan, and some say, an heiress. Some years after her solemn consecration, she lived with a reputable consecrated virgin friend in another diocese, but eventually decided to move to the home of her newly wedded sister and brother-in-law, “Max”. Max decided to circulate rumors by letter that Indicia was a fallen virgin. Eventually, Max informed their bishop, Bishop Syagrius, that Indicia had secretly given birth at a monastery and murdered her infant. In short, he accused Indicia of capital crimes. Strikingly, though, he did not sign his name to this accusation. People threatened to leave the Church if the bishop didn’t do something about Indicia. Bishop Syagrius bowed to public pressure: He ordered Indicia to undergo a medical examination. He did this solely on the basis of Max’s unsigned accusation without conducting a thorough investigation and fair trial. To soften the humiliation of this medical examination, he suggested that Indicia’s consecrated virgin friend, Marcellina, be present. Marcellina indignantly refused, as she was convinced of Indicia’ purity. Marcellina’s brother, a bishop, took up Indicia’s cause. He convened local bishops and held a trial. In addition to Max’s (unsigned) allegations, two women were the principle witnesses, as well as two men associated with them who spread the word about Indicia’s alleged activities. The two women fled before they could be questioned. The penalty for calumny was exile, and it is supposed that they did not wish to risk this. The two men were questioned separately, and like the Biblical story of Susanna, they gave contradictory accounts of the affair. It should be pointed out that Max had not signed his name to any accusation – he was essentially an anonymous accuser. The two female “witnesses” had fled (one of them had been seduced by one of the two males). The men gave contradictory accounts of Indicia’s alleged crimes- violation of her spousal bond with Christ as a veiled virgin, and infanticide. The legal analysis of the case was clear. There was no accuser – an anonymous accusation is inadmissible; at the time, an accuser had to provide proof of allegations or he/she could suffer severe penalties for calumny. There were no eye-witnesses. Indeed, the witnesses had fled the area. Witnesses are usually necessary for a just and fair trial, particularly when capital punishment and/or excommunication is at stake. It is widely accepted that the rationale for their disappearance was that the witnesses knew they would be committing perjury if they stuck to their story in court and that they would be liable to exile for calumny. This can be deduced from the hearsay testimony produced from their two male cohorts. Also, the credibility of one of the witnesses was weakened because she had been seduced by one of the two male accomplices. Most importantly, in analyzing this situation, is the fact that the two men who had been the women’s collaborators had contradictory accounts of the alleged crime. Thus, everything was “hearsay”, with no evidence and contradictory testimony from non-witnesses. The trial was just and transparent. Max and the two men were excommunicated until they were repentant and had satisfied the penances imposed upon them. Indicia was exonerated. Her own bishop was severely rebuked on several points. Syagrius had caved to public pressure. He also side-stepped the correct way of handling the issue: namely, he tried to informally try Indicia and attempted to force her – although she had the legal presumption of innocence – to have an invasive gynecological exam. The correct way of proceeding was to inform the public that he had not received a formal accusation from a named accuser and therefore her good name and reputation must be upheld. He was unjust because some of the faithful were threatening to leave the Church if he didn’t punish Indicia on account of the rumors. Also, not only did he side-step the legal route of holding a trial or judging that a trial could not take place on account of the lack of a named accuser; but he used his position to demand the medical examination. This was unjust and against the human dignity of Indicia, not to mention a potential sacrilege (on his part) precisely because it was uncalled for and unjust. Fortunately, Indicia had powerful friends — friends who thirsted for justice and truth, friends who understood the incredible violation being proposed by Syagrius. These were friends who were imbued by faith and who did not join the public lynching mob. Indicia could have lost not only her reputation but also her property and even her life, because of the malicious gossip spread about her by her brother-in-law, Max. Thanks to the efforts of her friends, Indicia was vindicated. It is easy for a case like this to happen again. False accusations are easily conjured, and with the internet, can be disseminated far and wide in a matter of seconds. For consecrated virgins who do not have a wise St. Ambrose or his sister, St. Marcellina, to defend them, it is necessary to know their rights when accused explicitly or implicitly of being a “fallen virgin”. In the first place, it must be remembered that sacred virgins do not make vows of obedience to their bishop. Thus, a bishop cannot command a virgin to ignore the situation or to just pray about it. He may offer advice but she is not bound to accept it. The virgin has never surrendered her natural law right to a good reputation. The only people who are forbidden to protect their own reputation are priests who are accused of solicitation in confession, because of the confessional seal. Secondly, even if there is an actual named accuser, the virgin must not presume that the bishop will presume her innocence, although the law requires that she be presumed innocent unless found guilty. Many a falsely accused priest has discovered that the first thing his bishop wants to do is to throw him to the wolves. Indeed, the bishop may try to pressure the virgin to admit guilt or quietly disappear from her apostolates by side-stepping due process and instead attempt an invalid “administrative procedure” (read: act arbitrarily) in place of a just trial – to rid himself of a potential liability to his diocese. Often this is done secretly to shield, not the accused, but the diocese from proper external scrutiny and to absolve the bishop from responsibility to observe applicable law. What would this look like? Let’s say the virgin is on diocesan committees, and she is immediately taken off of them and shunned in her parish/diocese. Her volunteer efforts are spurned. She is an “untouchable” despite the fact that no tribunal has judged and sentenced her according to due process, and she has been denied the opportunity to appeal to Rome. The injustice is compounded if her livelihood is dependent upon employment with a Church institution and she is fired or laid off as a result of unproven suspicions. Accused priests have often found themselves in limbo because their bishops refuse to be just and hold a fair and timely trial. They are instead kept away from ministry and under a perpetual cloud of suspicion despite a lack of evidence for their guilt. Why? Because bishops succumb to public pressure (or they give in to their lawyers who calculate risk) just like Indicia’s bishop did so long ago. Bishops are not perfect, and virgins must not naively assume bishops are, or canonize their every action. St. Ambrose rebuked Bishop Syagrius severely because he had, in fact, acted wrongly in the case of Indicia. The bishop has no right to stop the virgin from “being an apostle in the Church and in the world” when she has not undergone due process. This point cannot be over emphasized; many bishops will be tempted to treat the virgin as the enemy instead of as a spiritual daughter. They may try to informally “settle” cases to the detriment of the virgin, giving the clear signal she is guilty despite lack of evidence in order to please their risk-adverse lawyers or to bow to public pressure. Clericalism can have a significant role as well. To the clericalist mind, it is far better to uphold the “old boys club” than it is to worry about a “mere” non-ordained person. The bishop does not have the right — ever — to require a gynecological exam of a virgin. The virgin may refuse this point blank, always and under any circumstances. The virgin has the right to a good reputation. She has the right and sometimes the duty to sue those who unlawfully harm her reputation. It appears that St. Marcellina encouraged Indicia to take legal proceedings against her brother-in-law. Saints do not spurn justice or law. In an age when mercy is emphasized, it can be helpful to remember that God is just and that the Church and State would not have courts if it were wrong to seek justice. Indeed, one of the Vatican courts has the phrase “Without Justice there is No Charity” carved in Latin over its entrance. It is merciful for a sinner to be punished on this earth rather than in the next life. 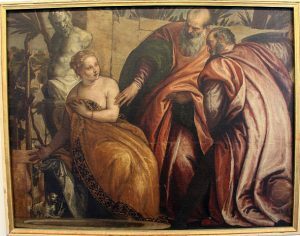 Thus, the virgin is justified and can be virtuous in pursuing civil and canonical means of defending her reputation in the tribunals of Church and State. Bishops and virgins are not the only ones who can benefit by Indicia’s story (the Latin version of her story is available in St. Ambrose’s Letter 5/6). The faithful also are reminded of something very fundamental. They must not indulge in rash-judgement. To enjoy and believe lurid tales of such serious nature without sufficient evidence pointing to guilt is rash judgement, and can be gravely sinful. It is also gravely sinful to be part of the lynch mob, so to speak, pressuring bishops to skirt justice and encouraging others to do likewise. We have only to look at the problematic popular treatment of “credibly accused” priests to see the dangers here. Shifting gears, I shall speak with a heavy heart concerning the current allegation that a consecrated virgin was the mistress of an archbishop. I am deeply saddened and disappointed that, just as in Indicia’s case, there are no named accusers, no actual proof offered. Yes, rampant speculation is cited, but not a shred of evidence has been proffered. There are no emails, no receipts, no contracts, no copies of visas or video footage or anything else offered to the public. Instead we have what appears to be the equivalent of office gossip being shouted to the rooftops regardless of whom it hurts. It is also disturbing that she was all but named in one version of the tale, but not her anonymous accusers. Since when is it right or just to vilify a private individual, whose very identity and holy vocation is at stake, not to mention the possibility of grave risk to her life and/or livelihood in her war torn, non-Christian country by reporting what has not been demonstrated to be anything other than hearsay and pure speculation? A person is usually considered innocent unless proven guilty. Is it possible that this consecrated virgin is being falsely accused? It is alarming to recall that St. Ambrose punished the people involved in falsely accusing the holy virgin Indicia with excommunication and strict penance. A “living image of the Church herself” should not be judged by unsubstantiated rumors published in the media, or by the online lynch mob, whipped into a frenzy because of other scandals feeding its lust for blood. If unlawful material or moral harm should come to her as a result of what appears to me to be simply printed hearsay, I doubt that God would treat such an offense against His sacred spouse lightly. Personally, knowing the sole woman who fits the identifying description given in one of the articles, and knowing that some of the things claimed as “facts” are to my knowledge not facts based upon pertinent conversations I’ve had with her over the years “in tempore non-suspecto”, I have no reason to find the published speculation about her to be credible. My argument is that if I have reason to believe that so-called “facts” are factually wrong and can be easily proven to be wrong, then why should I place my belief in the suppositions and conjectures of angry employees and former employees of the archbishop? who the true recipient(s) of the text(s) were – mother? sister? lover(s)? prospective lovers? employees? others? who the actual “author” is… is the authorship of the alleged text(s) genuinely the person being accused or is it someone who has had access to that person’s phone. Likewise, a “romantic relationship” or being a “lover” requires reciprocity. Where is the proof of that? Why has this one particular woman been flagged rather than scores of other potential people? What value can we really give to the words of angry persons who have not provided proof of their speculation? I call upon people to pray for this virgin and for the Christians who are rapidly diminishing in number in her country. As for the archbishop, I will say that he, too, enjoys the right to a good reputation but I would guess that he has better resources to defend this right. Pray for him and for all who are involved in this story.